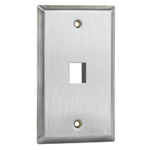 With a brushed Stainless Steel appearance, this blank single gang wall plate was designed to cover a junction or surface mount box. 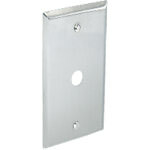 Our blank double gang stainless steel wall plate covers any larger surface mount or junction boxes. 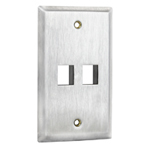 The Single Gang 1/2" round hole wall plate has a sleek stainless steel design and is used to allow easy access to cabling into walls. 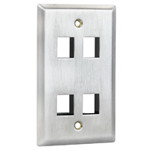 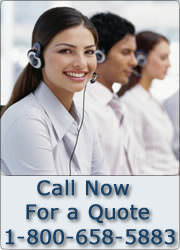 The RJ12 Hang Phone wall plate houses any RJ12 cables and has a stainless steel design for durability and strength. 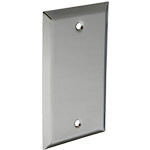 Stainless Steel BNC 1/2" D-Hole Single Gang wall plates are primarily used in commercial and industrial buildings to attach BNC telecommunication cables to a junction box, surface mount box, or a mud ring mounted in the drywall of a building. 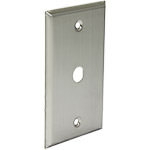 The single gang keystone wall plate was designed to allow keystone jacks to snap-in the open port. 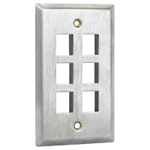 Designed specifically for keystone jacks, this single gang wall plate provides two ports for more connectivity. 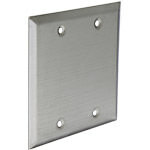 The Single Gang, 3 Port wall plate provides plenty of support for keystone jacks and connectors and includes the matching stainless steel mounting screws. 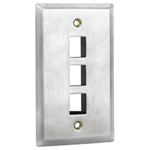 Designed specifically for keystone jacks, this single gang wall plate provides four ports for more connectivity. 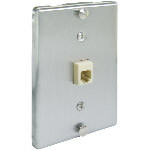 Once your wall outlet has been created, this 6 Port Single Gang wall plate will provide maximum connectivity for a single section needing keystone jacks.